Interest Groups AP Government. In 2003, the Congress overhauled the Medicare program, adding a prescription drug benefit. That benefit was controversial. 2 In 2003, the Congress overhauled the Medicare program, adding a prescription drug benefit. That benefit was controversial. Analysts estimated that the new law could increase drug company revenues by 9 percent ($13 billion) because more people would buy drugs under the new program. However, the drug companies were opposed to the importation of drugs from Canada, which are 75 percent cheaper in price. 3 In the first six months of 2003, the pharmaceutical industry spent $38 million to shape the legislation to their wishes. Since 2000, they have spent $60 million in political donations. 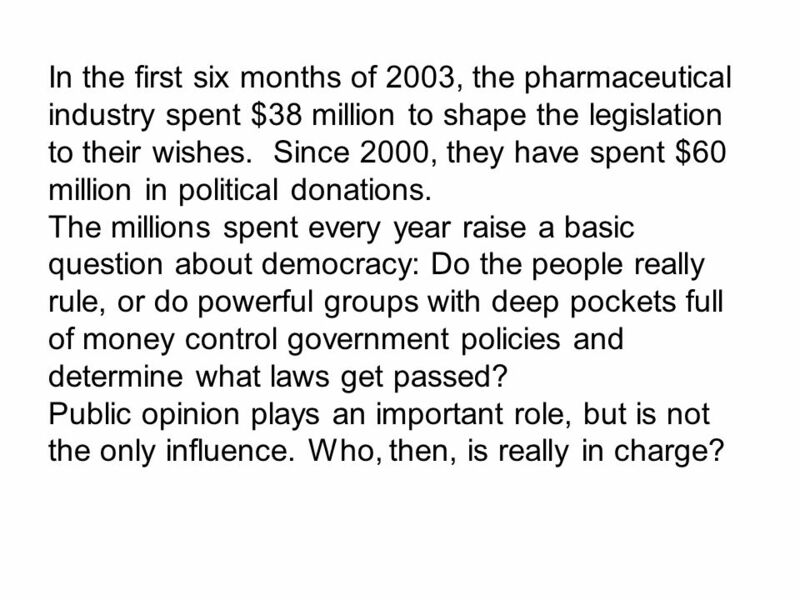 The millions spent every year raise a basic question about democracy: Do the people really rule, or do powerful groups with deep pockets full of money control government policies and determine what laws get passed? Public opinion plays an important role, but is not the only influence. Who, then, is really in charge? 4 Pluralism is a system in which many conflicting groups have access to and compete for the ear of the decision makers. It supposes that people are active in organizations to advance their interests. Sometimes people can be members of many organizations. Minorities, the poor, and consumers tend to be underrepresented or even left out in a pluralist system. 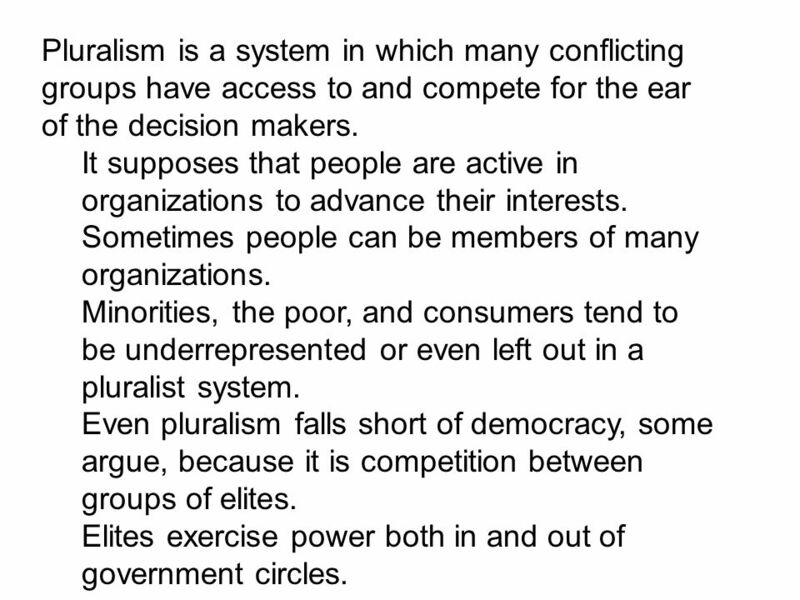 Even pluralism falls short of democracy, some argue, because it is competition between groups of elites. Elites exercise power both in and out of government circles. 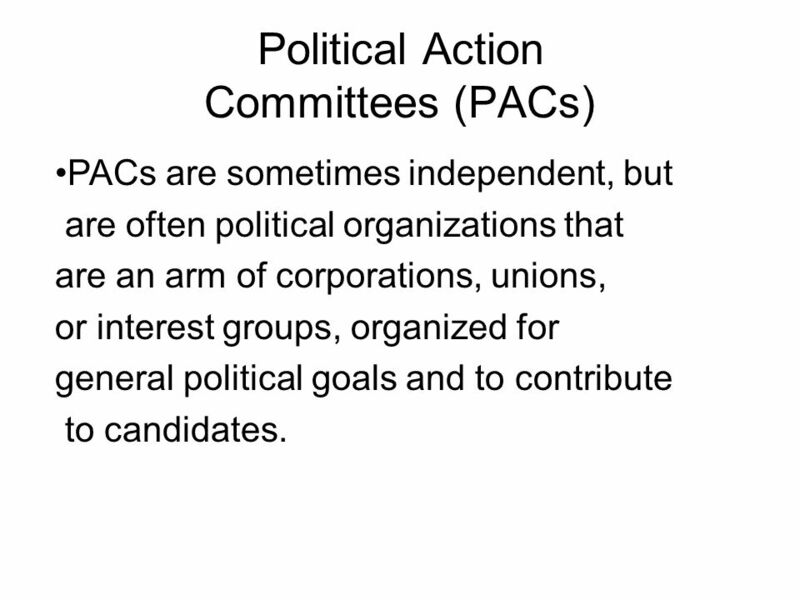 7 Political Action Committees (PACs) PACs are sometimes independent, but are often political organizations that are an arm of corporations, unions, or interest groups, organized for general political goals and to contribute to candidates. 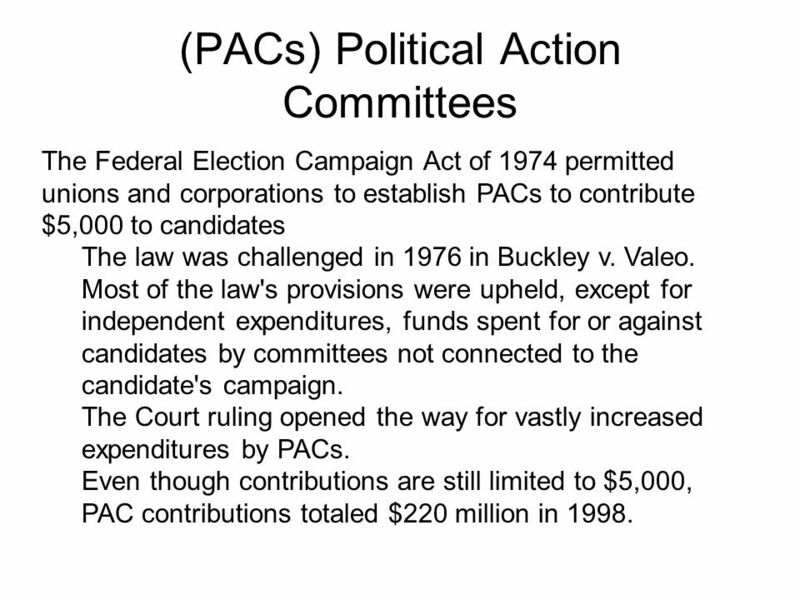 8 (PACs) Political Action Committees The Federal Election Campaign Act of 1974 permitted unions and corporations to establish PACs to contribute $5,000 to candidates The law was challenged in 1976 in Buckley v. Valeo. Most of the law's provisions were upheld, except for independent expenditures, funds spent for or against candidates by committees not connected to the candidate's campaign. The Court ruling opened the way for vastly increased expenditures by PACs. Even though contributions are still limited to $5,000, PAC contributions totaled $220 million in 1998. 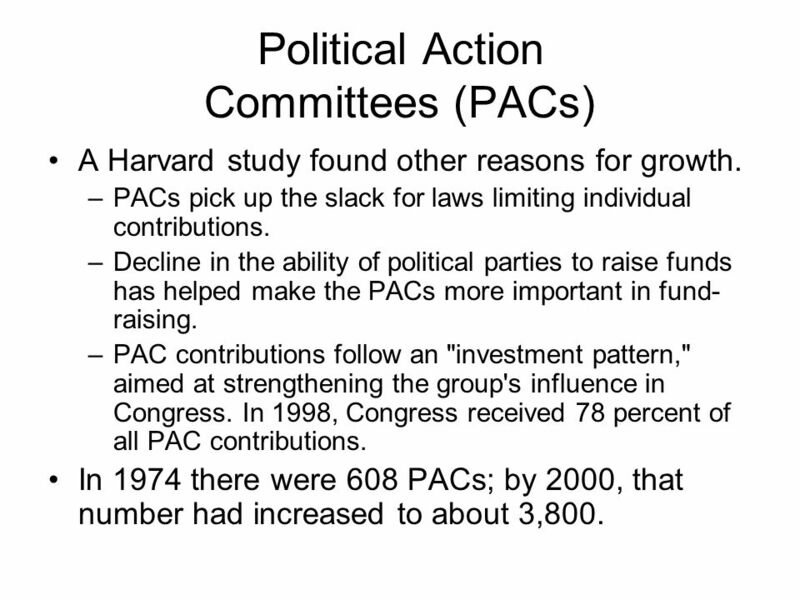 9 Political Action Committees (PACs) A Harvard study found other reasons for growth. –PACs pick up the slack for laws limiting individual contributions. –Decline in the ability of political parties to raise funds has helped make the PACs more important in fund- raising. 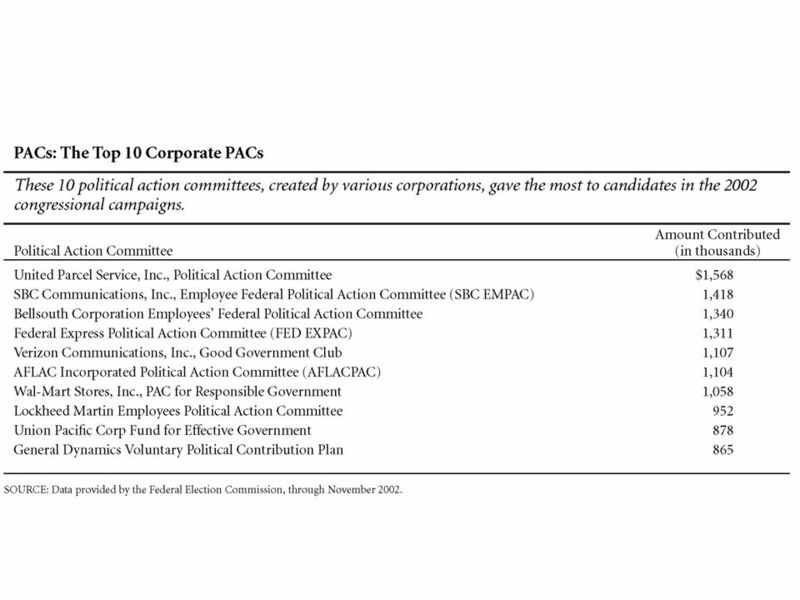 –PAC contributions follow an "investment pattern," aimed at strengthening the group's influence in Congress. 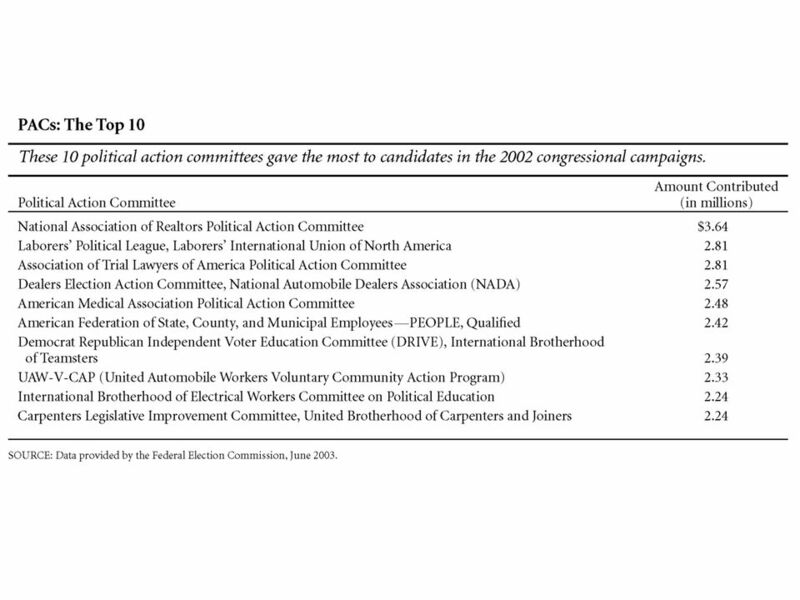 In 1998, Congress received 78 percent of all PAC contributions. In 1974 there were 608 PACs; by 2000, that number had increased to about 3,800. 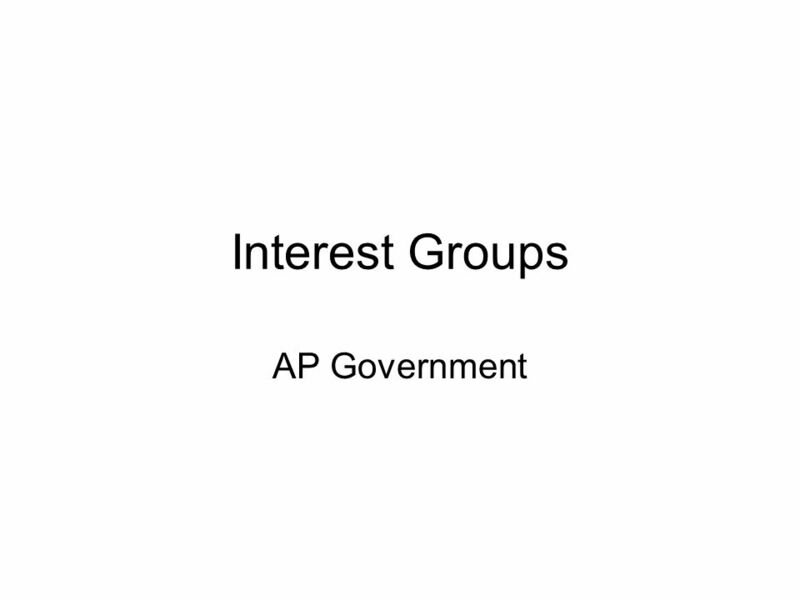 Download ppt "Interest Groups AP Government. 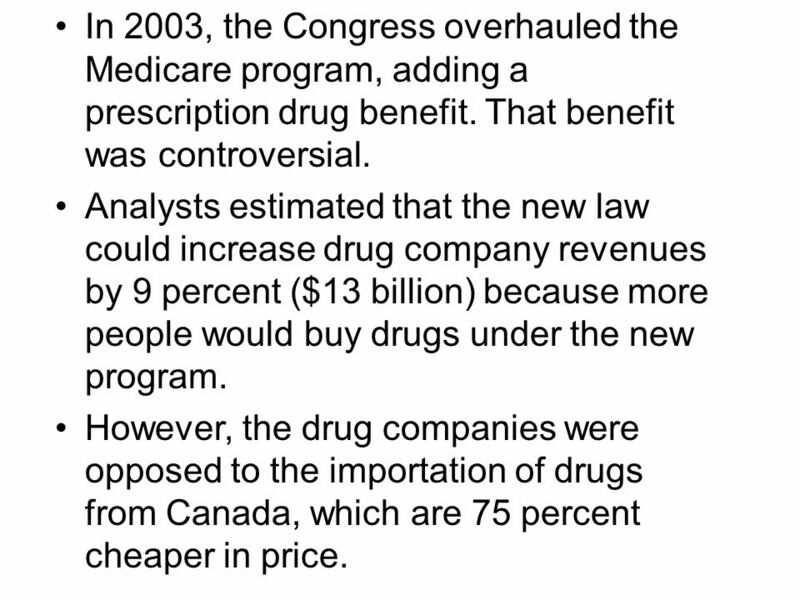 In 2003, the Congress overhauled the Medicare program, adding a prescription drug benefit. That benefit was controversial." Nature of Modern Campaigns Most electoral contests are similar in a number of ways. Nomination campaign aimed at winning primary. General election campaign. ELECTION SPEAK *Air war *Lame duck *Lobbyists *Mudslinging *Attack ads *Swing states, swing voters *Spin *Super PACs. Interest Groups. The Role of Interest Groups Interest group: an organization of people with shared policy goals entering the policy process at several. Political Parties  Political participation is an important duty of citizens in a democracy.  Political parties are one way for citizens to participate.  “Bypassing Campaign Contribution Regulation” warm up Bell ringer. Federal Campaign Finance Law. Federal Election Commission  Established by Congress in 1974, the FEC in an independent agency in the executive branch. Journal: Discuss with a partner What type of “groups” do you belong to? – Think…clubs, sports, band, charity organizations, etc… Why did you join these. Money and Politics Reference Ch 7.3. Homework: PP and IGs test on Friday FrontPage: OL on your desk. Describe two ways that interest groups can influence public policy. ISSUES Contributions: From what sources does money come? Where does it go? Should amounts be controlled? Expenditures: What can different “players” in. INTEREST GROUPS. Learning Objectives 12. Identify the different incentives that motivate people to join interest groups. 13. Compare types of interest. Section 1—The Nominating Process Money and the Election Process  The great paradox of modern elections: Money is a corrupting influence but candidates. Campaign Finance Reform. Federal Election Campaign Act (1974)  FEC created  Contributions disclosed to FEC  Limit on campaign contributions  Public. Money and Elections Chapter 7 Section 3.